Self-paced courses are delivered online and can be accessed using a computer. Self-paced courses allow learners to access content at their pace, and from anywhere at any time. This type of course is mainly interactive and can include video, audio or animations to enhance the learning experience. 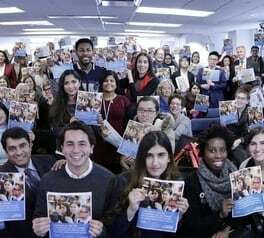 I Know Gender 1-2-3: Gender Concepts to get Started; International Frameworks for Gender Equality; and Promoting Gender Equality throughout the UN System Show details FREE! I Know Gender 4: Women´s Economic Empowerment Show details FREE! I Know Gender 5: Women´s Leadership and Decision Making Show details FREE! I Know Gender 6: Violence against Women and Girls Show details FREE! I Know Gender 7: Gender Equality in the World of Work Show details FREE! I Know Gender 8: Gender Equality and Education Show details FREE! I Know Gender 9: Sexual and Reproductive Health and Rights Show details FREE! I Know Gender 10: Gender Equality in Emergencies Show details FREE! 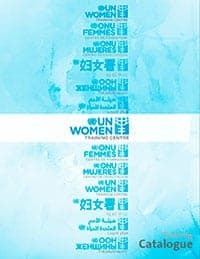 I Know Gender 11: Women, Peace and Security Show details FREE! I Know Gender 12: Sexual and Gender Diversity: A Matter of Human Rights Show details FREE! 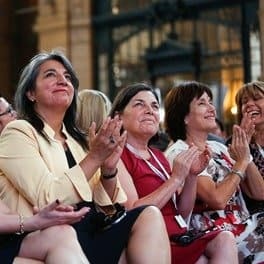 I Know Gender 13: Trade and Gender Equality Show details FREE! I Know Gender 14: Gender Equality and Voluntarism Show details FREE! I Know Gender 15: Gender and sustainable industrial development Show details FREE! I know Gender How To Series - Module 1: Implementing Gender Equality Markers Show details FREE! I know Gender How To Series - Module 1.1: Implementing Gender Equality Markers – Coding Definitions Show details FREE! I know Gender How to Series 2: Gender Equality and Sustainable project management Show details FREE! I know Gender how to Series 3: Mainstreaming Gender Equality in Infrastructure Show details FREE! Essential Services Package for Women and Girls Subject to Violence Show details FREE! IASC e-learning on Gender Equality in Humanitarian Action Show details FREE! How to Manage Gender-responsive Evaluation Show details FREE! Implementation of the UN Security Council Resolutions on the Women, Peace, and Security Agenda Show details FREE! 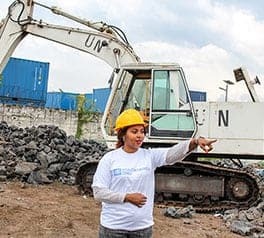 Gender in Humanitarian Action: Different Needs – Equal Opportunities Show details FREE! An introduction to CEDAW Show details FREE! 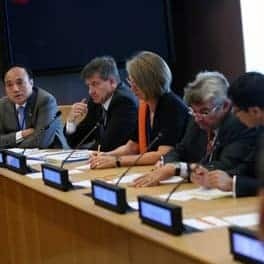 2030 Agenda for Sustainable Development and Gender Equality Show details FREE! Gender equality pathway for Managers and Programme and Admin staff Show details FREE! Results-Based Management Show details FREE! Understanding violence against women and girls Show details FREE! Scheduled courses combine moderated, blended and/or face to face methodologies. Moderated courses emulate the traditional classroom environment and take this experience to an online setting: they include reading materials, communication between participants and provide an opportunity for participants to receive support from facilitators via discussion forums, interactive webinars and other activities. Blended courses combine online and face-to-face learning. And face-to-face courses allow facilitators and participants to be present in a physical room, and combines presentations with interactive activities and group discussions to convey and exchange knowledge. 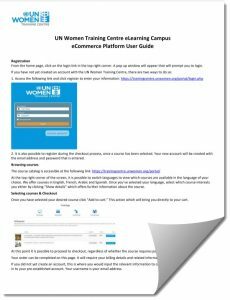 Customized courses: The UN Women Training Centre continuously identifies gaps in training and responds to demands for training on new contents. These courses are available on demand year-round in various learning modalities and can be customized to fit the needs of a specific audience.